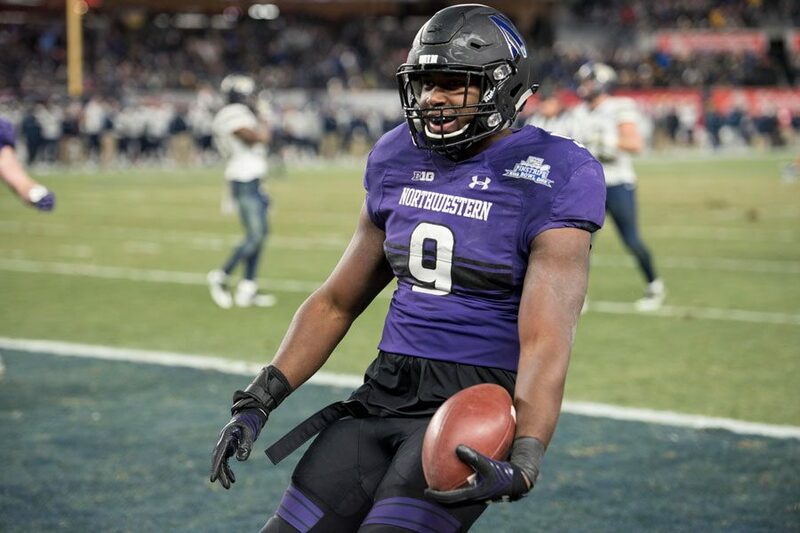 Garrett Dickerson celebrates after scoring Northwestern's go-ahead touchdown in the Pinstripe Bowl. The junior's reception came on fourth down. NEW YORK — Facing fourth-and-one at Pittsburgh’s 21-yard line, coach Pat Fitzgerald took a chance. Northwestern (7-6, 5-4 Big Ten) trailed No. 23 Pittsburgh (8-5, 5-3 ACC) 24-21 with 8:23 to go in Wednesday’s Pinstripe Bowl, and Fitzgerald’s team could tie the game with a field goal. Instead, Fitzgerald decided to roll the dice and go for a first down. It paid dividends: sophomore quarterback Clayton Thorson completed a short pass to wide-open junior superback Garrett Dickerson, who turned and raced along the sideline into the end zone. With the score, NU took a lead it would never surrender, going on to a 31-24 victory over Pittsburgh. The fourth-down conversion was the Cats’ fourth of the game on four tries and second on the drive. Just a handful of plays earlier, NU had converted a similarly bold fourth-down call when Thorson completed a five-yard pass to junior receiver Macan Wilson on a fourth-and-three just past midfield. Earlier, the Cats converted a pair of fourth-down quarterback sneaks from Thorson, with one coming on their opening touchdown drive and the other coming on their third touchdown march. All told, three of NU’s four touchdowns were made possible by fourth-down conversions. Thorson proved cool under pressure in fourth-down scenarios, and Fitzgerald lauded the whole team for its execution. The quarterback said he wasn’t surprised that NU pushed the envelope. Fortunately for the Cats, fourth-down conversions are within the rules. They took advantage, using every down to beat Pittsburgh and finish their season on a high note.